Eco Rodna Association is an NGO with its headquarters in Rodna, Bistrita County that aims knowledge, monitoring and conservation of all aspects of biodiversity. Its members are teachers, pupils from neighboring schools Rodnei Mountains, Rodnei Mountains National Park Administration and volunteers. Additional details about our activities and how to become a member on the site www.ecorodna.ro. NatuRegio Program - Nature Conservation and Regional Development in South-East Europe is organized by Alfred Toepfer Academy for Nature Conservation in Germany. The project took place from 15.02 - 30.10.2008, Deutsche Bundesstiftung Umwelt is funded by the Alfred Toepfer Academy for Nature & Conservation (Germany), with a budget of EUR 10 000. The project aims to establish collaboration between neighboring schools Rodnei Mountains National Park and Park Administration through the establishment of 20 clubs Eco pupils, who will be involved in monitoring various aspects of biodiversity in the park or the surrounding area. The project aims at the formation of cooperation in neighboring schools Rodnei Mountains, which will be the basis for future joint activities. 20. Ilva Mica - School - Inventory values local area of Ilva Mica. I.C.A.S. Campulung - Research dendrochronological spruce, juniper - pinus cembra ecosystems and limit the Rodnei Mountains National Park. After the project began an area of 46.399 hectares was established: Rodnei Mountains National Park including Pietrosul Rodnei Biosphere Reserve. This report includes tasks provided and results achieved during project implementation in Pietrosul Rodnei Biosphere Reserve (PRBR), including Pietrosul Rodnei Biosphere Reserve. Pinus cembra's reintroduction and restoration of the natural habitat of Pinus mugo and Picea Abies on 50 ha of depression Zănoaga conservation of all the habitats of flora and fauna in an area of 6.415 ha, including Pinus cembra / Pinus mugo / Picea Abieswas the major action composed by the project.By planting the forest will regenerate naturally, escaping the danger of Pietrosul's disappearance. Difficulties encountered during the transport of seedlings from Borsa to Pietrosul and difficulties related to fireplaces, seedlings carrying basket on his back, carrying earth borrowing to planting trees for the first film produced under the project. Then the question arises how to protect habitats in recent decades flora and fauna have been degraded significantly and thus conservation programs were required urgently. Therefore, the whole Rodnei Mountains National Park has designed a management plan and its implementation contributes to creating better conditions for the development of flora and fauna - better than in the past. Not only for Biosphere Reserve (6415 ha) but the whole National Park (46,399 ha). In addition an inventory of herbaceous and woody flora, birds and mammals, fish, amphibians and reptiles has been made. It was created to disseminate the second film showing some flora from Pietroşiţa. (By determining the species contributed by Dr. Gheorghe). Also in public awareness 2,000 flyers and 4,000 brochures have been printed and distributed. Drawing up an action plan with conservation and awareness that takes place after the project. 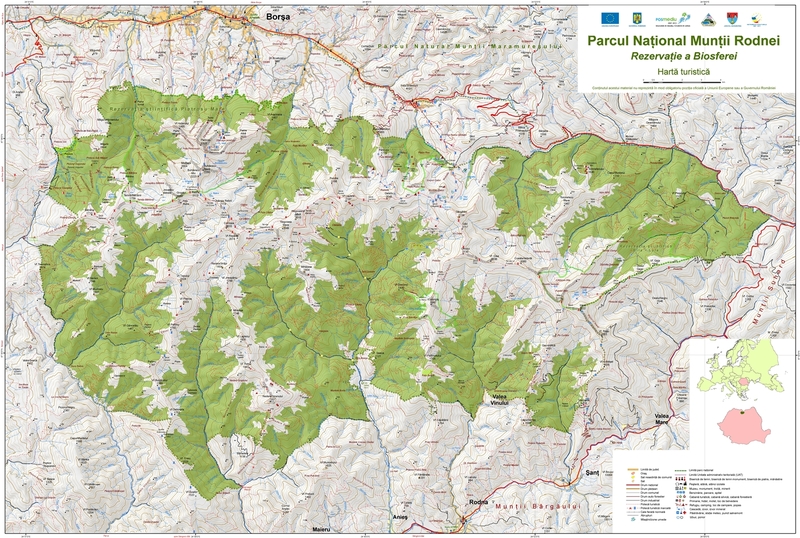 Objectives and Activities: biodiversity inventory of privately owned forests in Rodnei Mountains National Park and its vicinity, with participation of Tinerilor.Finalizat in 2009. 4. Project Darwin - Rodnei Mountains National Park Administration in collaboration with Oxford University in the UK - Involving youngsters in Rodnei Mountains National Park management. Rodnei Mountains National Park Administration has implemented Darwin project "Youth participation in management PNMR" in 2005-2008, funded by the Department for Environment, Food and Rural Affairs (DEFRA) of Great Britain, the Darwin Initiative and RNP-ROMSILVA Directorate Forestry Bistrita contributed to financing. It was a collaboration between the Environmental Change Institute (ECI) of the University of Oxford and Administration Rodnei Mountains National Park. The project was born from the desire to achieve a management plan participatory, involving all stakeholders especially students of schools and colleges bordering the park. Involving students, an essential part of the project was done through 8 Clubs Darwin "Friends Rodnei Mountains National Park" set up in eight schools in villages bordering the park (Rodna - School "Florian Porcius" - Professor Anişoara bindiu; Anieş - School "Justin Ilieşiu" - teacher Ilie HOZA; Sângeorz Spa - School "Solomon halite" - Professor Adela ear Năsăud - School Group Forest - professor Romelia COZMA, Professor Gabriela man on the street; Năsăud - School Mihai Eminescu and the Club students - Professor Stephen BUIA and teacher Dorina BUIA; Borsa - School No.2 - TIMIŞ Daniela teacher, Borsa - School Group - Professor Alexander Krupicer, Bistrita - Arts High School "Corneliu Baba" - Professor and Professor Claudia Mirela NELCA MARIAN. In these clubs activated during these 3 years over 100 students, guided by teachers, benefited both, students and tutors, of activities in nature, the monitoring of certain aspects of biodiversity in the park, environmental education. These clubs were established and the desire to develop interest among students and love for natural primarily native places was awaked: To train them as future role of supporters of the park and the activities undertaken by his administration to educate them in the spirit of respect for nature and local traditions, to offer an organized framework in which to showcase their knowledge, talents and creativity was the headline. In June 2005 it took place at Rodna a meeting of the two partners - Oxford University and APNMR respectively - an occasion that ended timing of project activities and signed a memorandum of cooperation for the three years of project implementation. There are regular meetings with project leader Darwin - dr. Anna Lawrence and project coordinator - Alina Szabo, of the University of Oxford, to analyze the activity of the implementation team, working sessions with tutors clubs to visit locations Clubs Darwin established schools and specialist from the University of Oxford, Dr. Susanne Conney lectured on the use of techniques to use GIS (Geographic Information Systems). They have conducted thematic terrain with pupil clubs under the guidance of staff from APNMR, teachers and coordinators in various locations across the park: Taul Muced, Cape Mount, Glade daffodils in Saca Valley Anies, Rebra Valley, Valley Cormaia, Lake Iezer Lake Ştiol. It created a biodiversity monitoring system for each club and has developed inveterate type plugs for field data collection. By centralizing this information, to create and update the database of clubs compatibility with the database of the park must be ensured. These were interpreted and subsequently transmitted for the purpose of laboratory specialists to be included in the management plan of the park. There were a butterfly stock inventory, beetles, spiders, Orthoptera, bird and mammal move locations in the park: Showing remarkable biodiversity inventory campaign obtained in the Corongis, where it was found a high diversity of species. The declaration was drafted and documentation required of this area as a scientific reserve. This event was attended by Mr. Marin of the Company Lepidopterological Goia Romanian and Claudiu Iuşan - APNMR biologist, Elijah Hoza - Anieş Scatiii ornithologist, Dr. Eugen Nitzu the Institute of Speleology Emil Racovita Bucuresti, Nae Augustin from the same institute and Alina Szabo ECI, Oxford University. Subsequently documentation has been completed and has been submitted to the Romanian Academy-Comnea for verification and approval. Four camp editions of "Darwin" were organized: downhill Blaznei edition on 23-25 September 2005, the second edition of 3-6 August 2006 in Blaznei Valley; third edition of the Iza 16-19 August 2006 in Spring and the fourth edition of the period July 8 to 11 2007 Anies Valley (Valley cottage department). Students in clubs benefited during these camps from a varied program; they have combined the activities of knowledge and field observations, hiking and campfire. The activities were organized and coordinated by an implementation team, Rescue, tutors clubs. GPS recognition on specific flora, thematic contests, observing aspects of biodiversity in the park, tourism orientation, general knowledge of first aid and environmental conduct were done. These editions of camps Darwin is a real breakthrough in terms of the organization and conduct of ecological education proposed in the project. During delegation of 19 to 24 March 2007: Oxford University and DS APNMR Bistrita exchanged experiences in two national parks in Slovakia, named the High Tatras national park Slovensky Raj National Park and between 19 to 24 May It held an exchange of similar experiences in two national parks in Bulgaria, namely Central Balkan National Park and Russenski Lom Nature Park. During these visits presentations and discussions on how the management of protected areas in Romania and Bulgaria, the stage of the Project Darwin, results and benefits practice participatory management, method practiced were held. The hosts showed their interest to the project presented and in Rodnei Mountains National Park, the landscape and its biodiversity. The national seminar "Participatory management of protected areas in Romania - current status" was organized on 24 November 2006 at Sângeorz Spa. Its purpose was in particular the exchange of experience between the institutions involved in the management of protected areas of Romania. The program included two sections: presentations by the organizers and guests, followed by workshops on various topics: the role of participation in the management of protected areas (PAs), opportunities and obstacles in practice a participative management in AP; This seminar reflected the current situation regarding participation in PA management in Romania and opened the door to future discussions and cooperation on this issue at national level. On 31 March 2007 the symposium "EU funds for people and nature" in Borsa (jud. Maramures) at Hotel Deer was held: The purpose of this seminar was to know local governments bordering the park's main European funds for Romania, opportunities of the local practices on implementation of European funds, types of eligible projects in Romania in major programs, identification of common objectives at the local level and proposals for possible projects in partnership with APNMR. On 02.04.2007 was held a conference in the Museum of Arts "Corneliu Baba" in Bistrita, for the official ECO Association fruitful. Members of this association are teachers and students of the Club Darwin, APNMR team and supporters of the research project. Eco Rodna goal is awareness, monitoring and conservation of all aspects of biodiversity. The main objectives are to promote local biodiversity values; promoting sustainable development through the rational use of natural resources; public awareness and knowledge on environmental compliance; initiation and development of projects on environmental protection; promotion of traditional elements in the area; events "bio-ethno-cultural"; consulting experts in inventorying natural capital. From December 8 to 12, 2007 questionnaires were applied inhabitants of the park bordering localities in order to analyze the knowledge of the park and the Darwin project. These questionnaires were applied by volunteers from the Lucian Blaga University of Sibiu, were pooled and compared with results similar action in the spring of 2006 and included in the final conclusions of the project. Forestry Department Bistrita and APNMR held at Valley Blaznei, on January 11, 2008 a national seminar titled "Model participative management in protected areas - a case study at Rodnei Mountains National Park". The aim of this seminar was to disseminate the project results and discuss the model used in Rodnei Mountains National Park with representatives of national and natural parks administrations currently existing in Romania. We have analyzed the methods and the results and how to apply this model in other protected areas in the country. Media coverage of the project activities was also made with the support of local media, as well as national and international; stakeholder meetings, the Management Advisory Board and the Scientific Council of PNMR PNMR; development of identification guides; Regular presentations in schools and communities: There were printed advertising materials, posters, brochures, information leaflets, maps in Romanian and English language and also calendars, pens and personalized trinkets that were distributed at all the events. They purchased equipment: ATVs, GPS units, a Pentium 4, 1 laptop, color printer, digital camera, binoculars, tents, nets ornithological bat detector. Oxford University and the National Forest - ROMSILVA organized in Bistrita, 10-13 March 2008 at Hotel Golden Crown, an international symposium entitled "Participation in nature: communities and protected areas in Central and Eastern Europe" crowned the work done in the three years of project. The purpose of this symposium was to share the results of implementation in Rodnei Mountains National Park. This original model of participatory management and discuss other systems and models was used in protected areas in Central and Eastern Europe. It was attended by delegates from 12 countries and interesting presentations and discussions took place. The project "Youth participation in Rodnei Mountains National Park management" was a real experience for their park. Innovative and constructive, this project was an opportunity for both employees and collaborators and also teachers and students who worked in Darwin (clubs in 8 schools). Time to start project activities in May 2005, a year after the establishment APNMR coincided and harmonize perfectly with the priorities and wishes of the administration, among which planning at participatory direct involvement of young people and stakeholders in the process. Thus, during three years of project new acquaintances were established and friends and employees of the park have learned how to manage external funds and organize a series of activities on regional and national level: monitoring activities field, ecological camps, regional and national seminars, international symposium and conferences, which have also contributed to creating a positive image of APNMR. The efforts of teachers, students, the implementation team from park specialists coordination team from the University of Oxford, were successfully completed in this project, which also brings a sense of satisfaction and accomplishment, a job well done. Thanks now, finally, to all who have supported this project to be running in such a good condition: RNP-Kerslake and Forestry Department director Bistrita-ing. Gheorghe IVAN, counseling and permanent funds provided co-financing the project; teachers directly involved in project activities; school management which hosted Darwin clubs for three years; students who worked in clubs for interest and seriousness manifested; parents who understood the importance of training children about protecting the natural environment and encouraged such activities; forest districts and municipalities that have supported the team of the park; specialists who contributed their research at completing the database of the park; Oxford University team for the professionalism and perseverance. Finance and Budget: Matra KNIP, the Dutch Embassy in Romania, 8.700 EUR. Objectives and activities: - scientific reserve Lala (IUCN). - March 9 of field experts in flora and fauna. Finance and Budget: Youth in Action, Action 1.2 Youth Initiatives, 7.000 EUR. Objectives and activities: - 50 trips biodiversity monitoring in PNMR. - More than 250 participating students. - Two camps in Little Valley, Anies. Finance and Budget: Youth in Action, Action 1.1. Youth Exchange, 9.000 EUR. Objectives and activities: - international camp (10 days) National Park Hainich-Werratal-Eischfeld in Germany with the participation of 36 young people (16 communities surrounding PNMR). Finance and Budget: Rompetrol, 8.000 EUR. Finance and Budget: Grundtvig, 130.000 EUR. Objectives and activities: - training of volunteer coordinators from APNMR. - Formation of a local volunteer coordinator (AER). - Publication of PNMR volunteer guide. - Exchange of experience with other parks on a voluntary basis (a volunteer ranger APNMR conducted in PN Abruzzo, Italy). - Hosting international volunteers from Latvia, Lithuania, Germany, France. Finance and Budget: Grundtvig, 400000 EUR. - Voluntary exchange with other national parks and biosphere reserves.